We review The Amberden Affair, a hidden role and simultaneous action selection game. In The Amberden Affair, players must try and discover who the murder is before he can poison enough of the party guests. Imagine this: you are at a cocktail party when suddenly people start dying. Someone here is a murderer! Ok, so maybe that’s not too hard to believe considering it’s a standard trope of television, movies and even board games. 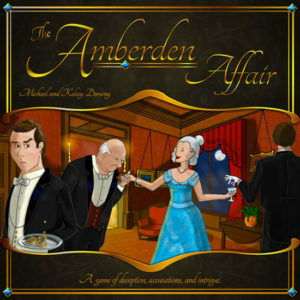 However, The Amberden Affair isn’t just a re-skin of Clue, it plays out very differently and one of the players is the miscreant who happens to be poisoning dignitaries. 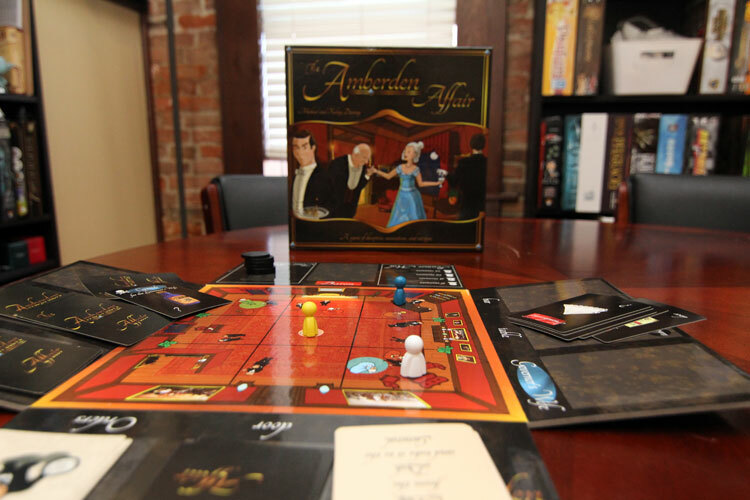 The Amberden Affair is an action selection game for 3-6 players that plays in about 45 minutes. Each player takes the role of a servant at a party in the illustrious Amberden Manor. Attendee’s include the Governor’s Wife, the General and the Baron. While all players will have orders they are attempting to carry out, one will also be trying to poison as many of the esteemed guests as they can without drawing too much suspicion. Each player is given an order to begin the round and may use an action to draw more. The Amberden Affair’s components are overall pretty disappointing. The board folds in a strange way that ultimately leads to it not laying flat on the table. This is especially problematic as you have to put small decks of cards on the fold-outs that are hanging in the air. The cards are very thin and extremely glossy. It gives the game a strange aesthetic overall. The game also includes some plastic tokens that are the redeeming factor for the components. The time markers resemble small plastic poker chips. The rumor tokens are especially cool. They are bright and vivid, shaped like awesome speech bubbles and in each player color. A game of The Amberden Affair is played over three rounds. 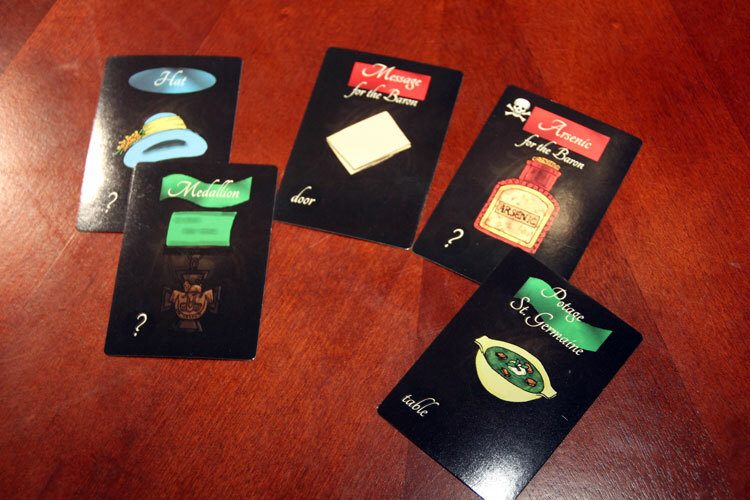 Each round, one player will secretly become the miscreant imposter. 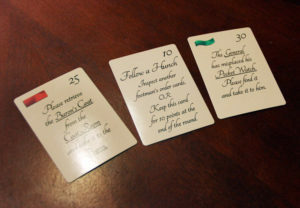 All players then get one order card that they will try to fulfill to earn points. Orders generally will tell you to get an item from somewhere and take it to a particular person. Some orders, which are worth a lot of points, don’t tell you exactly where the item is, so you may have to search multiple locations within the manor. Various items must be picked up and taken to the correct dignitary. Move one space, including diagonally. Look at the items in the location adjacent to you and take one item. Give an item card in your hand to a person you are adjacent to and look at their item pile. Draw a new order if you are in the head butler space. The wrinkle here is that all players are doing their actions simultaneously. You are trying to keep an eye on other players to see where they are going and what they are doing. But you must also complete you actions. 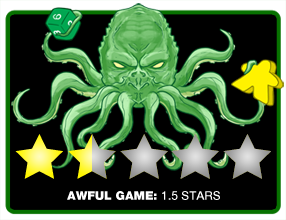 At the end of each turn, if you believe you know who the imposter is, you can add a rumor token to the rumor mill. The round can end in two ways. If the number of tokens in the rumor mill equals the maximum allowed for that number of players, the round ends. Otherwise, the round will continue until ten turns have been taken. If the round ends because of rumor tokens, there will be an investigation phase where players indicate who they believe the imposter is. Then scores are calculated for the round. You earn points for completed orders, some items and rumor tokens in the mill if you correctly identified the imposter. Incomplete orders and incorrect guesses about the imposter will cause you to lose points. The imposter scores points for completed orders but also for successfully poisoning dignitaries. After three rounds, the player with the highest score wins. The Amberden Affair board folds out, but the sides where you place the item cards don’t lay flat. For me, the Amberden Affair is quite a mixed bag. I love the idea of a simultaneous turns where you have to split your attention between your actions and the actions other players are taking. But there isn’t any pressure to take your own actions quickly. In theory, if you are the worst kind of gamer, you can just sit back and watch what everyone does and then take your actions. The addition of some timer or some bonus for being the first done would have been a welcome addition. Otherwise, the idea of having a traitor mechanic in what is mostly a pick-up and deliver game is really interesting. You have to pay attention not just to what you are looking for, but what else is in those locations. For example, if you know there is poison in the coat room, but it’s mysteriously missing later, you have to remember who has been there and could be the imposter. In practice, I felt like the imposter gave themselves away more often by how quickly they took their actions and how much they moved around. It’s possible I haven’t perfected the strategy of how to be the world’s best murdering butler. 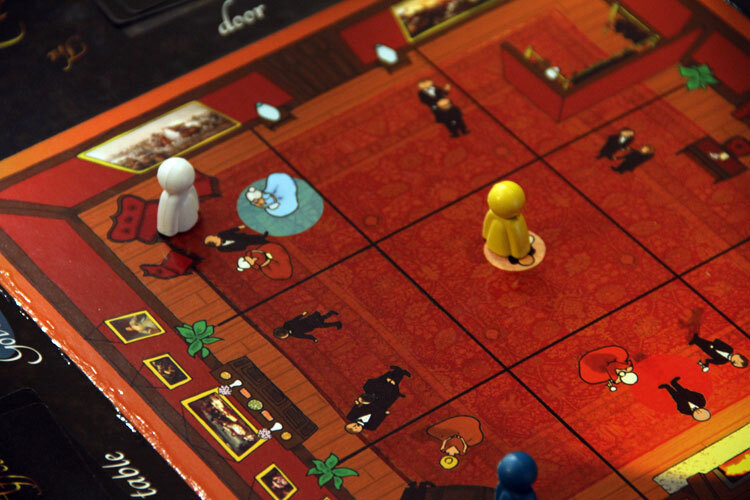 Players can move their pawns around the board to find items throughout the manor. Some of the order cards in the game allow players to look at items being carried by the other servants. These actions, if unused, are worth points at the end of the round. However, they can be extremely powerful. If you are the imposter and someone chooses to look at your hand when you are holding poison, you’re caught. Now, they have a vested interest in keeping your secret safe – they don’t want other players to get points from knowing the imposter as well. It just seems almost game-breaking at times, there is nothing the imposter can do to mitigate that happening to them. There just doesn’t feel like a lot of interesting decisions to make in The Amberden Affair. You grab an order card, run around to grab the item and drop it off. Any choices you have are really marginally important. You have to decide is how many orders to grab and hope you can get them all done before the round ends. That’s basically the extent of the thinking you really do throughout each round. The scoring at the end of round is cumbersome. Orders are worth the points printed on them. Incomplete orders are worth -10. If you are holding the gold coin, you get 25 points. Each rumor token is 20 points if you were correct, but -10 if you are wrong. The imposter scores completely differently, 40/90/150 points depending on if they successfully poisoned 1, 2 or 3 people. In addition, they score for their other completed orders. It’s not complicated, per se, but it just is a lot of math to do in the middle of the game. The fact that you basically reset the game completely and play it three times to play a whole “game” feels antiquated. It completely kills the ability to get into the theme of the game if you’ve spent the first 15 minutes just filling orders and now are changed into the imposter role. When it comes down to it, ultimately The Amberden Affair just feels like it is lacking. The components are subpar, the rules aren’t particularly clear, and there isn’t ever much of a feeling of tension in what thematically should be pretty tense. The mechanisms introduced here are interesting, but don’t fit together exactly like one would hope. If you’d like to get a copy of The Amberden Affair, you can pick it up for about $20. Final Score: 1.5 Stars – The Amberden Affair has some cool things going for it, but just not something I can recommend.